The official journal of ELRA, is the first international journal devoted to the acquisition, creation, annotation and use of language resources, together with methods for evaluation of resources, technologies and applications. Language resources include language data and descriptions in machine readable form used to assist and augment language processing applications, such as written or spoken corpora and lexica, multimodal resources, grammars, terminology or domain specific databases and dictionaries, ontologies, multimedia databases etc., as well as basic software tools for their acquisition, preparation, annotation, management, customization and use. 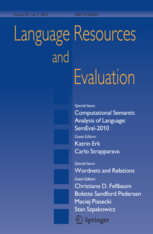 The evaluation of language technologies consists in assessing the state-of-the-art for a given technology, comparing different approaches to a given problem, assessing the availability of resources and technologies for a given application and assessing system usability and user satisfaction.